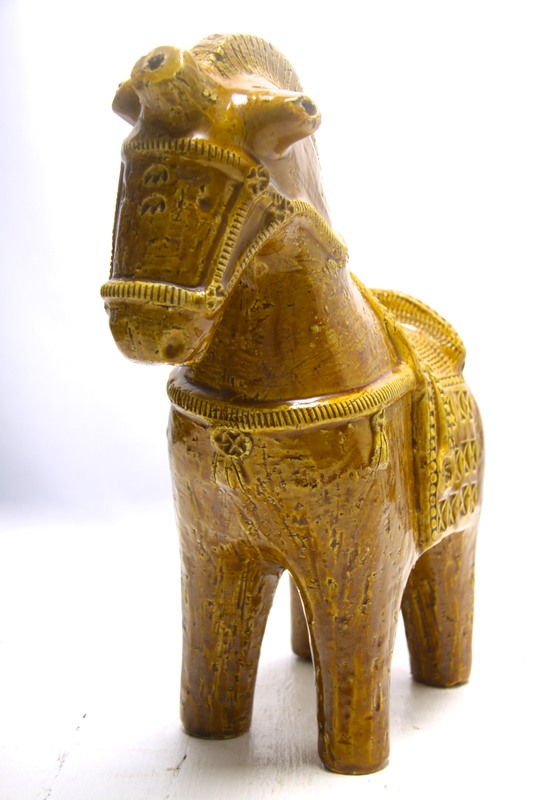 This is a stunning large vintage Bitossi Ceramiche pottery horse, made in Italy circa 1960’s. A wonderful stylised form to this ‘Cavallo’ (Horse) sculpture, designed by Aldo Londi in 1963. 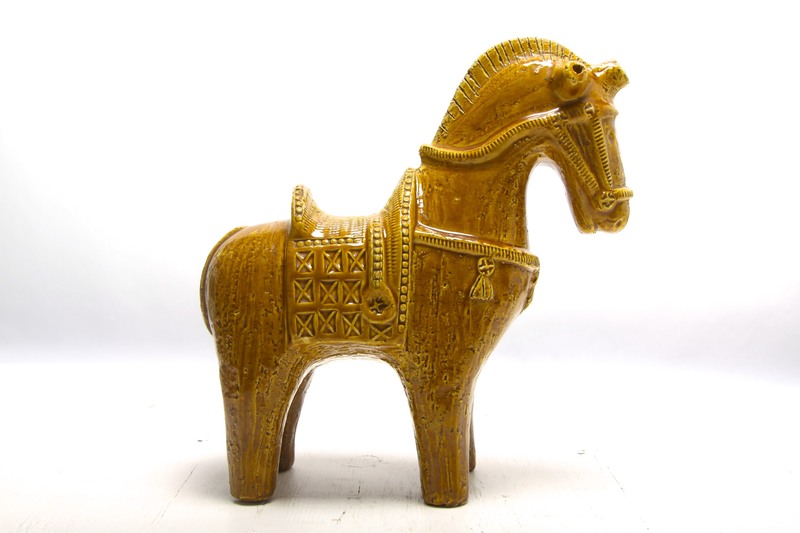 Resembling ancient clay horses made in Greece, Rome or China, very solid and imposing in stature. Beautifully detailed and decorated with impressed motifs and with a rough texture to the finish created using crushed granules in the clay, characteristic of Bitossi’s output and these techniques can be seen on the iconic ‘Rimini Blu’ pieces. Beautiful glossy layered mustard yellow glazes possibly a precursor to the ‘Sahara’ range, reminiscent of the sun and sand of the desert. Would make a fantastic display piece, and would look great in any 60’s, 70’s, retro, vintage, mid century modern, modernist or contemporary interior. 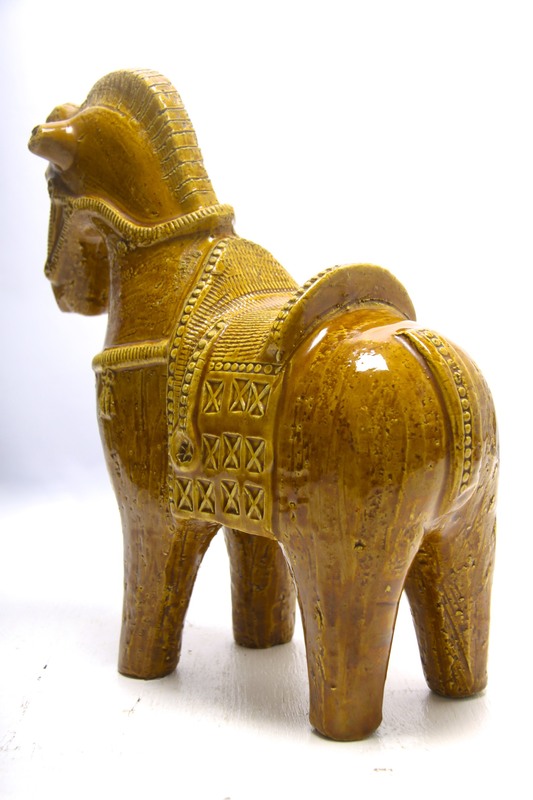 A great addition to any collection of Bitossi / Italian / European art pottery or 20th century design. Unmarked to the base as is common with these pieces. In great condition, no chips or cracks, there are a few small glaze flakes which have been previously coloured (see picture) could be painted over, do not detract overall. Measures 32 x 29 x 12.5cm / 12.5 x 11.5 x 5in. Overseas buyers please enquire about shipping costs, as this is a heavy item, weighing over 3kg, combined postage may be available.